Mercedes-Benz 300D Power Steering Pump Replacement at your home or office. Mercedes-Benz 300D Power Steering Pump Replacement costs $735 on average. What is the power steering pump and how does it work? The power steering pump is a belt-driven or electric-driven hydraulic pump that generates the hydraulic pressure needed to provide power steering assist. It develops output pressures of 1,000 PSI or more. The pump output is directed to the steering gear, often a rack and pinion type unit, where the hydraulic pressure pushes on the steering rack, greatly reducing the effort it would otherwise take to turn the steering wheel. Groaning or whining noise when turning. Noise can occur if there is wear on the pump bearings or impeller vanes. A low fluid level or trapped air can also cause noises. If the pump has already been operating while dry, adding fluid may not resolve the noise and replacement of the pump might be necessary. Power steering fluid leaks. Leaks can develop at pump seals, threaded connections, hoses, or on the steering rack and pinion unit. Pump seal leaks will generally require a replacement. Difficult steering. 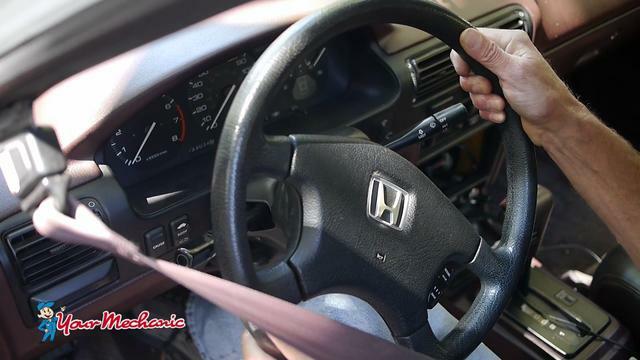 Should you notice it is harder to turn the steering wheel, it might mean the power steering pump output pressure is too low, or there could be blockages in the pump or lines. Damage to the pump pulley. Should the pump pulley become damaged or is loose on the pump shaft, you might detect vibration, drive belt damage, or hard steering. Either the pulley will have to be serviced or the pump assembly replaced. How do mechanics replace the power steering pump? If driven by a drive belt, the power steering pump is bolted to the engine via a bracket that allows for adjustment of the pump drive belt. Once the engine is cold, and safe to work on, the drive belt is removed. If driven by an electric pump, the pump may be mounted in conjunction with the steering shaft or in conjunction with the steering rack. With either a drive belt or electric pump, removal of any dash, panel, or steering components is performed to access the pump. The threaded connectors to the pump inlet and outlet are loosened and removed. Any mounting bolts and brackets are removed so the pump can be removed. If the old pump has failed catastrophically, or there is reason to suspect contaminants in the power steering hoses, the system is flushed. The new pump is bolted on, the pressure and return hoses attached and the system is bled of all air. If pump is belt-driven, it is tightened to the manufacturer’s specification. Finally, the engine is run and the car is road tested to confirm normal steering effort. If a new drive belt was installed, belt tension is measured again, and adjusted as needed, after the belt has run for a few minutes. Is it safe to drive with a power steering pump problem? No. If the power steering pump is operated without an adequate amount of fluid, and the pump reservoir will not hold fluid due to a large leak. The pump could seize, which would snap the serpentine belt and likely leave you stranded. If the pump turns and there is adequate fluid, but there is no power assist, it will require much greater effort to turn the steering wheel, and that presents inherent safety risks. Generally, the wisest course is to seek immediate repairs if you suspect a problem with any component in your car’s power steering system. Any belts driving the pump should be inspected and replaced as needed. The pump will only produce the required hydraulic pressure if it is driven by the belt at an adequate speed. Power steering leaks from aged rubber hoses, particularly where the rubber is crimped to the steel tube, are not unusual and should be carefully inspected. The system operates under high pressure. The fluid is flammable, and if leaking fluid happens to contact a hot engine part, a fire might result. You always want to be sure the hoses and connections are sound.